3D upgrade kits and complete 360 crime scene cameras, crime scene reconstruction software installed on your servers (chain of custody). Perkins grants provide thousands of dollars to law enforcement agencies under the Homeland Security act, which funds the camera and time to capture and produce complete school 360 documentation online. CSI360 is used by fire-arson scene investigators. As Seen in the CSI TV Show! CSI:360 was actually used in a CSI TV show. In this episode called, "Buyer Beware," you see the close up of the computer and a make-believe website called Internet Realty. The shot of the living room is a panoramic 360 and reveals a valuable art object is missing. This is how VPiX became CSI:360 with our product being seen on national TV. 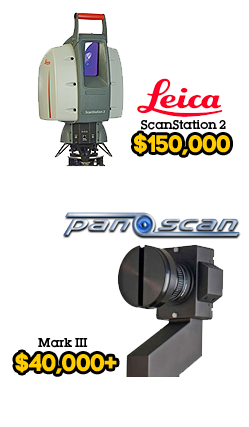 Today, CSI:360 panoramic camera kits and software is used by law enforcement agencies and the FBI. 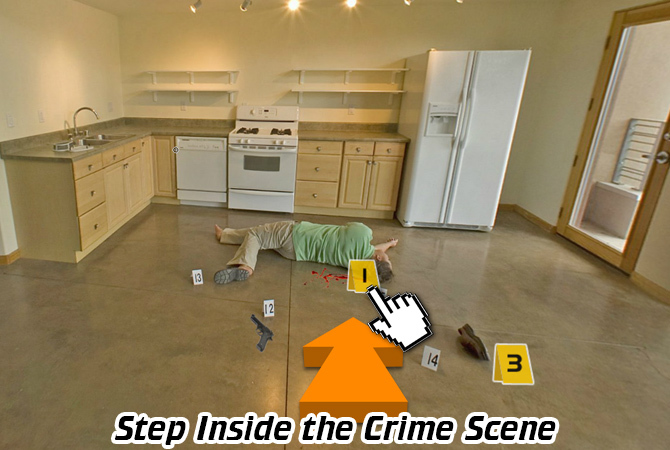 Recreating crime scenes doesn't have to be expensive or take days to do. Budgets at any police department are shrinking. Doing "more with less," is the new "normal," these days. Which is why we love CSI:360. It’s affordable and we can keep our existing Canon camera investments. All prices are for GSA / Government and domestic U.S. only. Prices shown reflect “base model” systems. All orders will receive a custom quote. The FASTEST way to put the "bad guys," behind bars. 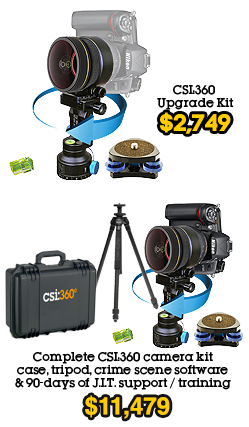 Recreating a crime scene with your existing resources and cameras can be done quickly and affordably with CSI:360. STEP 1: You photograph the crime scene by capturing panoramic images. Each 360 view is captured in just (4) shots. STEP 2: Log into your CSI:360 secure account and upload your stitched panoramas. Add digital crime scene markets, field notes, interactive hot spot arrows, Bing or Google GPS maps or floor plans. STEP 3: The District Attorney presents the evidence in the court room. A guilty verdict is reached and the bad guy gets convicted. STEP 4: Bad guy goes to prison. 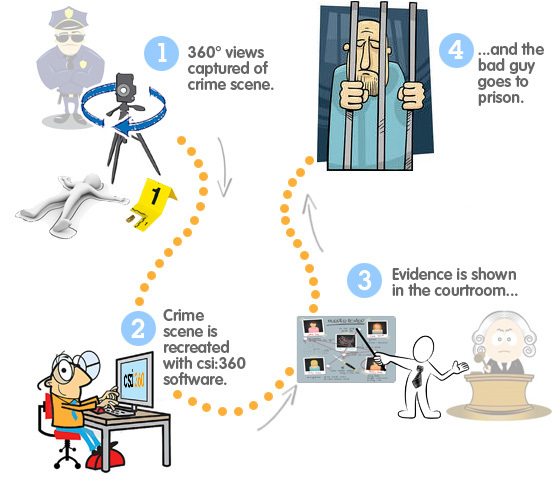 Following the proper “chain of custody” best practices, you can export finished 360° crime scenes and archive them to USB, CD-ROM and other media. 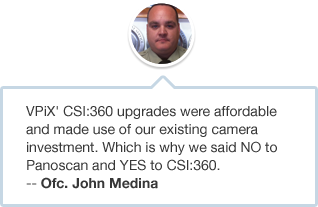 * CSI:360 crime scene software is available on demand, month-to-month with a managed service level, or you can buy the CSI:360 server and we can ship one to you. Ask your account manager for details and an instant quote. CSI:360 sales and service is now available worldwide. With offices now in the United Kingdom and the Middle East, CSI:360 camera equipment, crime scene reconstruction software and training / support services are now closer to our valued customers. CSI:360 can be used with a managed service level solution with our Rackspace.com hosting partner. Or, you can order CSI:360 server edition and host it at your own facility.